Exe packer updated, which should prevent DEP false positives in the latest versions of Windows. Winmail Opener 1.6 has fixed hanging on some kinds of files and improved attachments extracting algorithm. Winmail Opener 1.5 features some minor improvements, more languages and silent uninstall option. We've made some tweaks and bugfixes, check them out: Changes list. Flash Movie Player 1.5 released! What's new? Volume control, Screensaver mode, "Installed Flash information" command, some bugs fixed. Changes list. 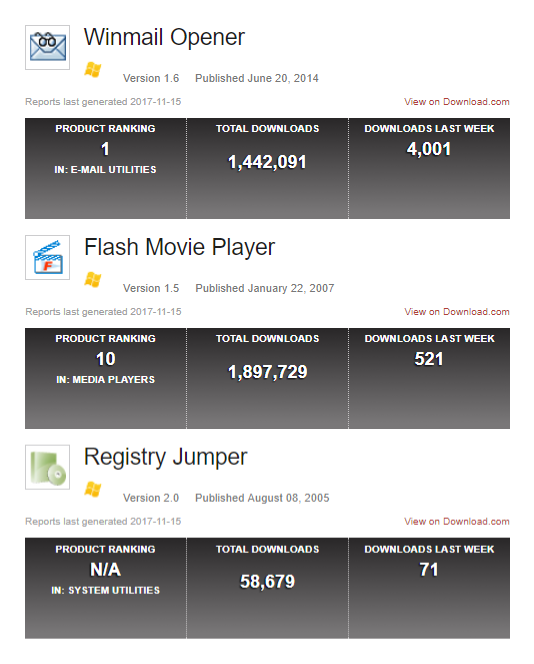 Flash Movie Player homepage. Added ability to save rtf message while working in command-line (silent) mode. Winmail Opener homepage. Some improvements made, some bugs fixed. Flash Movie Player 1.4 released! Fixed some bugs, added snapshoting functionality. Whatsnew?. Flash Movie Player 1.3 released! New release of our freeware swf player Flash Movie Player. Firefox & Opera cache support, revised playlists and other enhancements. Flash Movie Player 1.2 released. Fixed some bugs, background movie color setting added; now player restores fullscreen if it was closed in fullscreen mode during the last launch. Flash Movie Player 1.1 released. Multilanguage support added (Translate Flash Movie Player into your native language! ), some new features and improvements: Open from web, Add from IE cache to playlist. See more at Flash Movie Player page. Flash Movie Player 1.0 released. New version of Registry Jumper released. Registry Jumper 2.0 is available for download. Added Favorites support (Quick launch from favorites, Add to favorites, Organize favorites, Export favorites list to HTML format). Now you can get access to your important registry locations in several clicks! Installer support. What's new? Flash Movie Player 1.0 Beta released. Flash Movie Player is a free stand-alone player for ShockWave Flash (SWF) animations, based on Macromedia Flash Player plug-in. In addition to all Macromedia Flash Player abilities, it has some extended features, such as animation rewinding, advanced full screen mode, exe projectors support and play lists. More about Flash Movie Player.. Updated version of Registry Jumper is available for download. Some bugs fixed. What's new? Registry Jumper is a small freeware utility that makes system registry navigation easier. This tool allows you to open desired registry keys in Windows® Regedit by one click. Works in two modes: GUI mode (graphical interface) and command-line mode (open registry key supplied as command-line parameter). Additionally, Registry Jumper handles the "regjump://" custom protocol, which, for example, can be used in links in HTML pages to point to specific registry locations. More about Registry Jumper..